In his first nationally televised appearance, on the big band leaders Tommy and Jimmy Dorsey's TV variety show, Elvis Presley shocked the country with his sultry and sensational version of all-time classics like 'Heartbreak Hotel' and 'Blue Suede Shoes'. And, although the Dorsey Bros. show might have been his first national appearance, it was the legendary Ed Sullivan performance that truly put him on the map, so to speak. 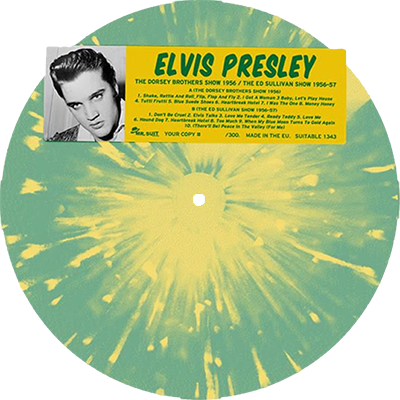 'Elvis Dorsey Brothers Show 1956 / Ed Sullivan Show 1956 / 1957' Splatter vinyl is a Limited hand numbered Edition of 300 copies includes both of those legendary appearance in one place! Dorsey Brothers Show 1956 / Ed Sullivan Show 1956 / 1957 Splatter vinyl. Limited numbered Edition of 300 copies.